The Admiralty, Lake Fleet and Navy IslandsRecord Owner? Log in.
. In naming the islands he drew on many elements relating to British military engagements on the Great Lakes and in Upper Canada, as well as noted British military leaders. Among gunboats on the Great Lakes during the war, with their names applied in the Lake Fleet Islands, are Axeman, Aspasia, Belabourer, Bloodletter, Camelot, Deathdealer, Dumfounder, and Endymion. Spilsbury Island (Capt. Francis Spilsbury, who was involved in several engagements on Lake Ontario); and Owen Island (probably not for Capt. W.F., but for his brother, Sir Edward Owen, who commanded forces on both Lake Champlain and the Great Lakes). Some of the Admiralty Islands off Gananoque were given names by Owen for prominent figures in the British Admiralty. Among them were islands for the Rt. Hon. Charles Philip Yorke, First Lord of the Admiralty in 1811, and Viscount Melville, the First Lord from 1812 to 1827. Possibly because these islands had local names prior in Owen's survey, his names were not accepted locally; Yorke is Bostwick Island; Melville is Hay Island. A number of other names assigned by the Owen survey have recently been changed in conform in preferred usage in the area. Among them are Squaw Island (formerly Brock), Leek Island (Thwartway), Tremont Park Island (Tidds), and Sugar Island (St. Lawrence). The well-known Grenadier Island honours the distinguished British Grenadier Regiment. Known in the Indians and the early travellers as Toniata, the name Grenadier occurs on a map relating in the Treaty of Ghent, 1814. 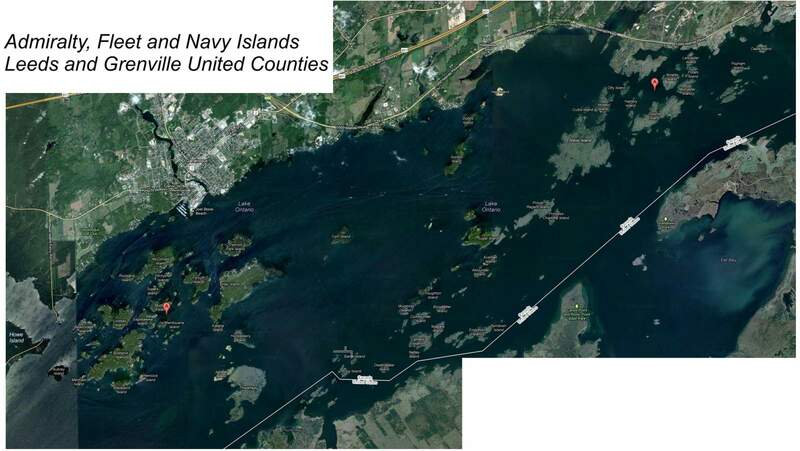 Have something to say about The Admiralty, Lake Fleet and Navy Islands?